Cavite is a province at the southwestern edge of Luzon and is part of Region 4-A CALABARZON; is situated southwest of Metro Manila. The province is mainly a flat land to which most of its area is agricultural. But most of the agricultural lands are now transformed and developed into residential areas. Its eastern edge is the Palay-Palay, Mataas na Gulod mountain range which comprises of mountains of interest by hikers and is the highest point of Cavite at 664 MASL. The southern edge of Cavite is the Tagaytay Ridge (~600 MASL) which borders the Taal Caldera and is the easiest cold escape from the hot and humid Metro Manila. This province is also well known as the place where numerous battles have taken place which in turn resulted in the declaration of Philippine Independence. This article aims to give a comprehensive guide on how to get in and out of Cavite. This the newest 5-kilometer highway project which pierces through the edge of Manila Bay bypassing the busy city of Bacoor. Also called as R-1 Extension. This highway is the easiest access point from Manila to the eastern towns of Cavite and to the Palay-Palay/Mataas na Gulod mountain range. This route is also used by public utility vehicles but always have a light traffic. Newest 4-kilometer expressway project linking Daang Hari road of Bacoor, Cavite to the South-Luzon Expressway via Susana Heights exit. This is an extension of the R-1 project that pierces through Mt. Pico De Loro and is a shortcut to Nasugbu, Batangas coming from Metro Manila. It shortens the travel to Nasugbu from Manila from 4 hours via Tagaytay to only 2 hours via Cavitex. This will officially open on July 1, 2013, and is only initially open for private vehicles. This is a secondary road entrance to Cavite which was the primary and the only entry to Cavite coming from Manila when Cavitex is not yet open. This entrance will allow you to pass through Zapote River and Bacoor city proper. Accessible by PUV. This is a walkway crossing Zapote River from Las Pinas specifically from BF Resort Village and shortens the travel time when commuting from Las Pinas to the residential area of Molino Bacoor. This is a road accessible by public utility Jeepney and is a commute route to the residential areas of Molino, Bacoor, Cavite from Las Pinas City. This is a road that is primarily accessed by private vehicles coming from Alabang, Muntinlupa and is now used by multicabs (PUV) from the malls of Alabang which includes Alabang Town Center and Festival Mall to the residential areas of Molino, Bacoor. Private vehicles can use this road to pierce through Molino and Anabu Imus at its end point towards Aguinaldo Highway and eventually to Tagaytay. This road is a shortcut to Cavite if you are coming from San Pedro, Laguna which pierces through a residential road to Daang Reyna and back to Daang Hari to access Molino Bacoor and Anabu Imus to Aguinaldo Highway. 9. Carmona / Binan, Laguna Entrance. This road will pass through Governor's Drive coming from South Luzon Expressway Carmona Exit. Governor's Drive will allow you to easily access Dasmarinas, General Trias, Trece Martires, and Indang Cavite. This is a route for both private and public vehicles. Coming from Sta. Rosa Laguna Exit at SLEX, going all the way straight passing through Nuvali will end up on Tagaytay. Private vehicles only. 11. Calamba - Tagaytay Highlands Entrance. A private road piercing Calamba Laguna to Tagaytay Highlands. A steep road to access Tagaytay coming from Talisay, Batangas. Public Utility Jeepneys coming from Talisay are available here. A steep road to access Tagaytay coming from Talisay, Batangas and is for private vehicles only. Adventure riders use this road for a breathtaking steep ride from Tagaytay down to Talisay Batangas. Mostly an exit point from Tagaytay and Cavite to the Nasugbu and Calatagan towns of Batangas. An exit point to magnificent beaches of western Batangas. PUV passes through this area as well and is near Mt. Batulao and Talamitam. This ferry will get you to Corregidor Island, the air defense island during the American colonization and was heavily bombarded during the World War II. Buses are available at Cavite Batangas Bus Terminal at the ground parking area at the back of Coastal Mall in Paranaque City to which will pass through Aguinaldo Highway all the way to Tagaytay. The route will pass through Cavite towns such as Bacoor, Imus, Dasmarinas, Silang and then will end up at Tagaytay Rotonda. From there jeepneys are available so you can tour Tagaytay City. Some jeepney is also available at Roxas Boulevard corner MIA road (Coastal Mall) that uses this same route but the endpoint is only either at Imus or Dasmarinas, Cavite. Public utility multicabs are available at Festival Mall in Alabang, Muntinlupa which can drop you off at SM Molino, Bacoor. It will pass through Daang Hari. The terminal is at Barangay Talaba, Bacoor near Aguinaldo Highway and will pass through the residential area of Molino, Bacoor to Paliparan in Dasmarinas City, Cavite. A bus which you can ride at the Cavite Batangas Bus Terminal at the ground terminal located at the back of Coastal Mall, Paranaque to which the endpoint is at Ternate, Cavite near the Palay-Palay Mountain range. It will pass through Cavitex all the way to the towns of Kawit, Bacao of General Trias and the Cavite Export Processing Zone (CEPZA), Tanza, Naic, and Maragondon via Centennial Road. Some of the buses can only drop you off at Naic to which you still need to ride a jeepney from there so you can reach Maragondon or Ternate. If you would like to reach Caylabne, Puerto Azul, and Mt. Pico De Loro, you need to hire a jeepney or tricycle from the Ternate bus station. A bus which you can ride at Manila City Hall to which the endpoint is at Trece Martires or Indang, Cavite. It will pass through Aguinaldo Highway of Bacoor, Imus, and Dasmarinas and will turn right to Governor's Drive to which it will either end up at Trece Martires or Indang depending on the destination. Riding a bus to Naic or Ternate (red-orange), you may stop by at Naic corner Indang road and a jeepney is available to which you can ride to get to Indang. Is a jeepney which you can ride at Metropolis mall at Alabang Muntinlupa which will pass through SLEX and will exit at Carmona through Governor's Drive to. General Mariano Alvarez (GMA), until the part of Dasmarinas which they call Pala-pala (Transport Terminal near the vicinity of SM Dasmariñas) . A route of buses and jeepneys plying through General Trias Drive to reach the General Trias town proper and Gateway Industrial Park. Using the Lawton - Ternate PUVs (red-orange), drop off at Tejeros (Gen. Trias Drive corner Centennial Road.) Riding a bus to the North will get you to SM Rosario at Rosario, Cavite or south to General Trias Town Proper. Is a bus plying from Tagaytay to Alfonso to Maragondon. A route to the coffee production plains of Cavite. A baby bus and jeepney route from SM Bacoor passing through Tirona Highway to Binakayan, Kawit Cavite. Some passing through Island Cove if they specify it, then straight to the intersection at Kawit which they call as Zeus (pronounced by locals as ze-yus) to Magdiwang Highway passing through the Aguinaldo Shrine, Kawit, Noveleta and SM Rosario of Rosario, Cavite. Same as the Bacoor - Rosario route (orange) but will turn right at San Juan to Cavite City before you reach Noveleta. This route will get you to Sangley Point (Philippine Airforce Airbase) and to the ferry port to Pasay City. 1. Aguinaldo Shrine (article here) - a historical landmark to where Philippine Independence was declared. 2. Battle of Alapan (see article here) - Last battle ended the Spanish colonial rule in the Philippines. 3. Battle of Zapote (see article here) - Battle that cut off Spanish supplies in Cavite and the battle of Cavite against American colonizers. 4. Battle of Imus (see article here) - First victorious battle again Spanish forces in Cavite. 5. Tejeros Convention (see article here) - first presidential election for the independent Philippines. 6. Bantayog ng Labintatlong Martir ng Kabite (see article here) - A monument of 13 martyrs of Cavite, all members of the separatist insurgency against Spanish colonial rule, the Katipunan. 7. Bonifacio Shrine (article here) - site of where Andres Bonifacio was executed. 8. Mt. 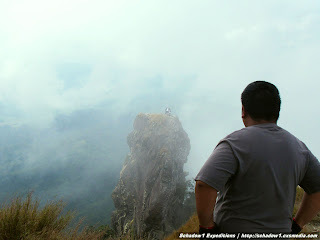 Pico De Loro (article here) - the highest peak of Cavite at 664 MASL. 10. Puerto Azul - the famous beach at Ternate, Cavite. 11. Caylabne Bay (article here) - famous beach resort at Ternate, Cavite. 12. Corregidor Island - Air defense island during the American colonization era at the middle of Manila Bay. 13. Fort Drum - Island turned to a concrete machine gun and used as an air and naval defense during the American colonization era. 15. Island Cove - a private resort at Kawit, Cavite accessible via Lawton - Ternate or Bacoor - Rosario PUV route. 16. Taal Vista Hotel and Zoo - located at Tagaytay City. 17. Picnic Grove - beautiful public picnic area at Tagaytay City overseeing the Taal Volcano. 18. People's Park in the Sky - A discontinued project of the Marcos government which was originally planned as the Malacanang Palace of Tagaytay and is now used at a viewpoint overlooking Taal Volcano as it is the highest point in Tagaytay City. 19. Sky Ranch (see article here)- newest theme park at Tagaytay City. 20. Malibiclibic Falls (see article here) - Located at the valley between Mataas Na Gulod mountain range and Aguinaldo Town, is a hiker's comfortable relaxing escape. 21. Balite Falls (see article here) - Located at Amadeo Cavite near the Crisanto M. Delos Reyes road, is now a private resort yet affordable. Great for swimming and picnics. Take note though that this gets cramped up during summer. For more coverage of Schadow1 Expeditions on the province of Cavite, check it out here. Is the van route from Gen. Trias to Alabang (via Daang Hari) still available? Can I get to Festival Mall by using that route? Can I use the same route to get back to Gen. Trias? How can i get to nxp cabuyao from sm molino? thank you so much for sharing this, this is very informative! How do I go to Statefields School/UPHSD coming from Alabang? Any jeepney or bus I can ride? Thanks! Just want to make a correction with your post, GMA or General Mariano Alvarez is never been a "part" of Dasmariñas. GMA was a part of Carmona and now it is already an independent town with its own government. Honestly, this is the first time I saw a post pertaining GMA as "part" of Dasmariñas and you gave me a good laugh at it. Hi! Just wondering, can i go to corregidor island from ternate or naic? if yes, do you have any idea about the transportation? Thank you so much! is there a bus or any mode of transportation travelling to pnpa silang cavite at night? i will arrive manila by 7 pm via plane .. planning to be there before 7 am the next day for an urgent commitment ... please anyone help? The only way to go to Silang from Terminal 1 is take a cab to Coastal Mall terminal, from there ride a bus (signage) Silang or Tagaytay bus. Tell the driver to drop you off in PNPA. (I think you need to ride a jeepney or tricycle going to PNPA) landmarks near is AUP (Adventist University) and Tagaytay public market. -I used to live in Cavite for 14 years. How do i get to Diamond Hotel from Imus? We need to go to alonte football in binan laguna, we are coming from imus aguinaldo hi way. What is the best way to commute? hi! how do i get to san pablo city from carmona, cavite thru public transport? Is there a van available at festival mall going to imus cavite?